Heron Park play structure. Photo credit: Richard Van Winkle. Mill Creek’s Parks and Recreation Board provides advice to the city council regarding the development, design, and operation of park and recreation facilities. They submitted their recommendations for the city’s biennial capital planning to the Mill Creek City Council at the September 11, 2018, meeting. 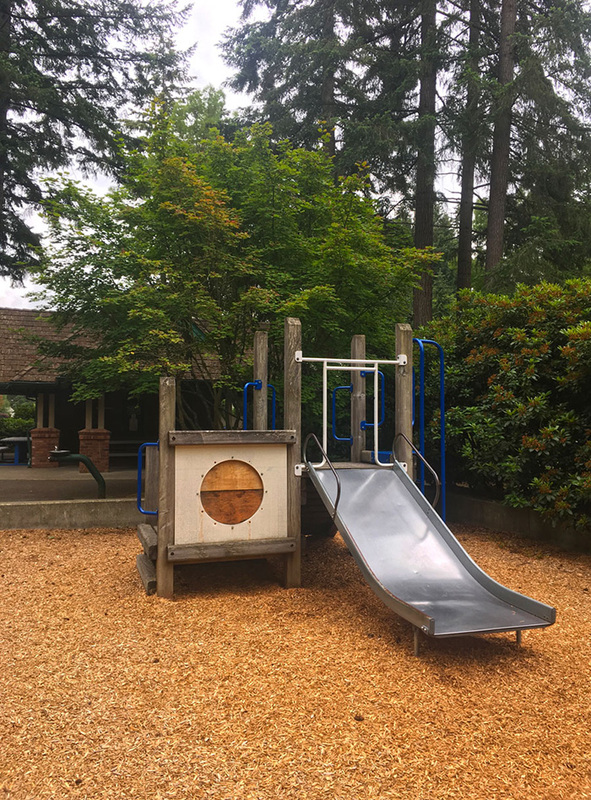 “The board prevents things from slipping through the cracks and being neglected in regards to our local parks,” said Peter Lalic, board member. Lalic, who has lived in Mill Creek for 25 years, previously served on the Planning Commission for more than 10 years. He cites his involvement as contributing to the City’s success in making it a great place to raise a family. “I feel strongly that if you want a nice community or city, you must work at it,” said Lalic. Most if not all of these items were corrected by city staff in 2017. A number of Mill Creek parks need repair this year. For example, members of the public protested the removal of Heron Park’s swing set this year. Update and replace play equipment to meet safety code and regulations. Replace the park shelter roof and gutters. Evaluate drainage for the soggy grass area behind the tennis courts. Replace damaged park shelter sign, sign board plexiglass, and the men’s restroom sign. Remove rebar in the wooded trail area. Implement Cougar Park Phase II of clearing out brush and building a trail in the wooded area. Tighten fence in tot area and fix the fence behind storage shed at back of the park. Replace and secure the screen net over the scoreboard. Fix wheels on the soccer goals to allow smooth rolling and prevent tears on the new turf. Reposition the garbage can from the parking lot into the planter bed to open up two additional parking spaces for field rental users. Replace plexiglass in the sign boards. Fix gutter drain spout by the playground. Look into ways to permanently replace fence post caps by the playground due to continual replacement of the caps. Fix the large dip/sink spot in the basketball court and repaint the court. Replace tables with composite material to reduce regular maintenance needed for oak tables such as pressure washing and staining.